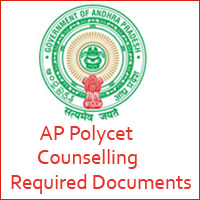 AP POLYCET Counselling Required Documents 2019 updated. So, the candidates who have qualified in the AP Polytechnic Common Entrance Test can check the below Counselling details. Look at this page and get more information regarding CEEP Exam 2019. We have provided the AP Polytechnic Entrance Exam Documents list along with the Certificates Order. So, the interested candidates check below for further details regarding sbtetap.gov.in CEEP required documents list. A huge number of candidates all over the Andhra Pradesh have applied for the Polytechnic Entrance Exam 2019. The candidates had completed the exam successfully. Recently, Andhra Pradesh Government has released the AP POLYCET 2019 Results. Now the candidates qualified for the exam are searching for the AP CEEP Counselling Required Documents 2019. To help you we have provided precisely the documents required for the Andhra Pradesh POLYCET Counselling Procedure. So, the interested candidates can check the below details for more clarification about the AP Common Entrance Test for Polytechnic Exam. You can also check the AP POLYCET Counselling Process here. Name of the Organization State Board of Technical Education and Training. Exam Name Polytechnic Common Entrance Test (POLYCET). You should know that the first part of the AP CEEP Counselling process is certificate verification. So, all the candidates should verify your documents at any one of the helpline centres given below. Without verifying the Certificates, you are not eligible for AP POLYCET Web Counselling i.e., web options entry. So, the candidates must remember all these information related to the AP Polytechnic Entrance Exam 2019. AP POLYCET is a State Level Entrance Exam. State Board of Technical Education and Training (SBTET) will organize the AP POLYCET Exam. The exam is conducted to provide admission into various Engineering and Non- Engineering Courses. So, the students who want to pursue the professional courses can appear for the AP CEEP Counselling process. We have updated all the Documents required for the CEEP certificate verification. So, we advise the students to check all these necessary documents needed during the AP CEEP 2019 Counselling time. You should keep in order all the documents as given below. So, the candidates need to check the Certificates required for AP POLYCET Counselling so that you need not feel tense at the last minute. 10th Class or its equivalent Marks Memo. AP POLYCET 2019 Rank Card. IV to X Study (Bonafide) Certificate. Income Certificate issued on or after 01.01.2015. Caste Certificate (if they belong to OBC, SC & ST) issued by the competent authority. PH/ NCC/ CAP/ Sports/ Minority/ Anglo-Indian Certificate if applicable. The information provided above is only for the reference of the aspirants. So, the candidates need to check the official website. We will also update the latest information of AP POLYCET Counselling Required Documents on our site. We have also provided the direct link to the official website on this page. So, the interested candidates visit our site regularly for all latest updates. Is TC compulsory for verification?